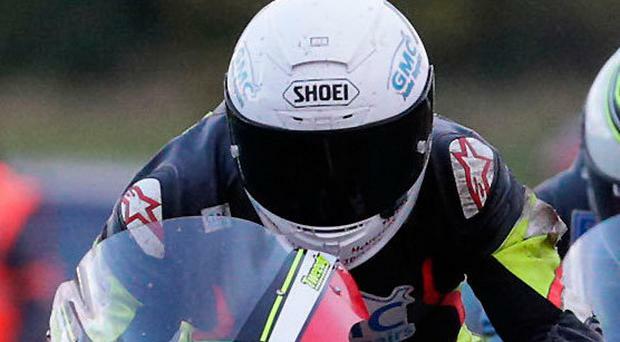 Darryl Tweed, in his second year racing in the Manx Grand Prix, made it a double win in the Ultra Lightweight class this week by taking victory in yesterday's three-lap race. Tweed's opening lap of 105.839mph took him into a 30 second advantage at the end of the 37-mile lap, stretched to 48 seconds when he came in for a fuel stop at the end of lap two. The Ballymoney man's lead was reduced to 13 seconds at Glen Helen on the final lap as the second and third placed riders did not stop for fuel, but Wednesday's winner was in brilliant form with a final lap of 103.026mph to stretch his winning margin to almost 30 seconds over Tom Snow in second, with Andrew Cowie just over seven seconds further back in third. In the concurrently run Lightweight Manx Grand Prix there was a dramatic second win for Skerries rider Andy Farrell after race leader and new lap record holder James Chawke retired his 650cc Paton on the fourth and final lap at Ballagarey when holding a 50 second lead. Chawke led the race at Glen Helen on lap one, then was black flagged at Sulby for marshals to check a reported problem with his machine. However, nothing was found and he got going again, credited with the time lost, to lead the race by five seconds from Gary Vines, Dave Butler and Farrell. On his second lap, Chawke set a new lap record of 114.993mph to extend his lead to 15 seconds as he pitted for fuel. With a 50 second lead going onto his last lap, Chawke only got four miles in when the Paton developed a problem, forcing him to retire, with Farrell the new race leader at Glen Helen by three seconds. Farrell powered over the mountain on his final circuit with a lap of 114.650mph to win the race by six seconds from Vines, with Butler a further three seconds back in third. In an equally dramatic four-lap Senior Manx GP the lead changed hands six times on the opening lap and a half before half distance leader Matt Stevenson pitted for fuel with a three second lead, however he incurred a 10 second penalty for not stopping his engine while refuelling, dropping him to second behind Stephen Parsons. In the last lap and a half, Stevenson rode like a demon, constantly eating away at his rival's lead and eventually taking first position back at the Bungalow, seven miles from the finish, going on to win by five seconds from Parsons with a 120.974mph last lap. The best of the Irish was newcomer Mike Browne, Farrell, Chawke and David Lumsden in positions 4-5-6-7. The seventh round of the AJ Plumbing Ulster Superbike Championship takes place today at Kirkistown, while the penultimate round of the Nutt Travel Ulster Motocross Championship takes place at Laurel Bank Track near Saintfield today.